I don't know how about you, but i luuuuve-love-love dulce de leche. It's so insanly carby, and fattening - hence delicioso! Everything carby,sweet and fatty is. I used to think that dulce de leche was some kind of complicated concoction, sort of a secret recipe, ferociously guarded by hispanic abuelitas and Kraft. It's just a can of condensed sweetened milk, left simmering on your back burner for couple of hours. There is one trick though - always, always make sure that the can is fully submerged in simmering water. And also, after you've done simmering it, make sure the can cools down to room temperature and only then open it. But that's just common sense, right? Right? 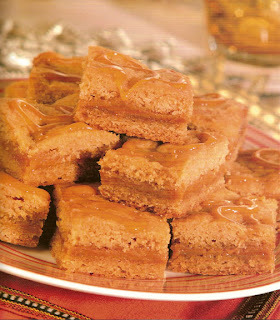 So, anyway, i feel like posting this recipe for yumsters Dulce De Leche Blondies, because i miss my friend Cleia. Cleia likes those. You don't have to be an accomplished baker to whip this blondies up;but i know that some of you are quite handy with the rolling pin. Mnacakanov, ezizim, i'm talking to you. Grease 13 x 9 x 2-inch baking pan. Sift together your flour, soda and salt. Or, if you're lazy, just dump them all together in the mixing bowl and run your whisk back and forth through it a few times. Add your eggs & vanilla and beat until smooth. Scrape the bowl couple of times, while you're at it. Gradually add your flour/soda/salt mix. Beat until smooth, about 1 min. or so. Spread about half of the batter in your greased pan. Bake in your preheated oven for 7-8 min. Let cool for about 5 min. Presumably, by now you've already cooked your can of condensed milk, cooled it and hopefully didn't devour half of the can on the spot, next to your kitchen sink. Hopefully. So, take a spoon and drop spoonfulls as even as you can all of Dulce De Leche (formerly known as condensed sweetened milk)on top of the batter. It will be kinda gelatinous and lumpy and sorta non-cooperative. But, baby, don't sweat it. It's all gonna come out good. Then spread the rest of the blondie batter on top of non-cooperative dulce de leche. Swirl it with the knife for fanciness. Cool, cut and share with the ones you love. This recipe is adapted from my KitchenAid recipe booklet. Only instead of the Dulce they use 1 (14 ounce) package caramels and 1/2 cup evaporated milk. They melt all that stuff together and then put it on the batter. Seriously, who needs packaged caramels if you can have fabulous Dulce? I, for one, certainly don't. Also, if you get your creative juices flowing, you can add all sorts of good staff to your batter. Like chopped macadamia nuts, for instance. Or white chocolate chips. Or butterscotch chips.